When I visit antique shows in search of vintage crochet, I am always amazed and excited with the variety I find. I see vintage patterns and never see the actual piece. Then I see a piece that I have never seen the pattern for. On rare occasions, I find both and that is exciting. I found this potholder at the Liberty Antique Show. 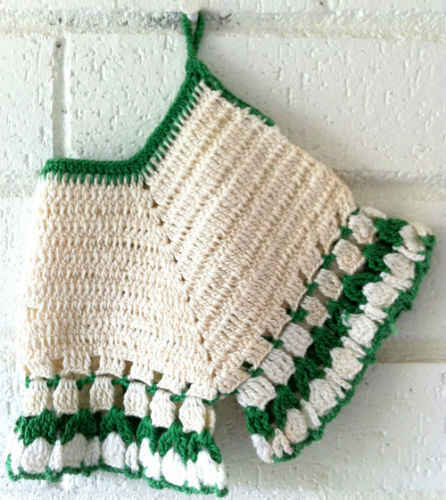 It is a unique twist on the Bloomer Potholder. Bloomer Potholders are so nostalgic and reminiscent of days gone by. The vintage potholders are more for collecting than actual use. 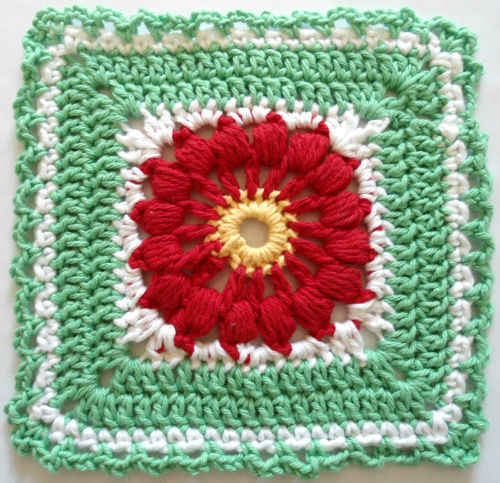 They can be used as hot mats but they are not recommended for potholders. Materials: Number 10 Crochet Thread: White & Green; Thread needle. ch-2 sp, (2 dc, ch 2, 2 dc) in ch-2 sp, rep from * once; (dc in next dc) across to end. At the end of Row 5, join with sl st to first dc. (dc in next dc) around; join. Rnd 12: Ch 3, DO NOT TURN, dc in next dc, (ch 2, skip next 2 dc, dc in next 4 dc) 5 times, * ch 2, skip next 2 dc, dc in next 3 dc, (dc, ch 2, dc) in ch-2 sp, dc in next 3 dc *, (ch 2, skip next 2 dc, dc in next 4 dc) 11 times; rep from * to * once, (ch 2, skip next 2 dc, dc in next 4 dc) 5 times, ch 2, skip next 2 dc, dc in next 2 dc; join. Finish off and weave in ends. Rnd 1: With right side facing, flatten to align points, working through both thicknesses, join Green with sc to ch-2 sps at point, ch 4, working in single thickness around leg, (sc in next ch-2 sp, ch 4) around; join with sl st to first sc. Finish off and weave in ends. Rnd 2: With right side facing, join White with sl st to any ch-4 sp, ch 4 (counts as first tr now and throughout), 3 tr in same sp, ch 2, (4 tr in next ch-4 sp, ch 2) around; join with sl st to first tr. Finish off and weave in ends. Rnd 3: With right side facing, join Green with sl st to any ch-2 sp, ch 4, (tr, ch 2, 2 tr) in same space, ch 2, * (2 tr, ch 2, 2 tr) in next ch-2 sp, ch 2; rep from * around; join. Finish off and weave in ends. Rnd 4: With right side facing, join White with sl st to ch-2 sp in middle of tr-group, ch 4, 3 tr in same sp, ch 4, sl st in next ch-2 sp, ch 4, (4 tr in next ch-2 sp, ch 4, sl st in next ch-2 sp, ch 4) around; join. Rnd 5: With right side facing, join Green with sl st to any ch-4 sp, (ch 4, sl st in next ch-4 sp) around; join. Finish off and weave in ends. – Repeat on other Leg. Row 1: With right side facing, working in bottom of Rnd 1 between each dc, join Green with sl st between first 2 dc, ch 3, (dc between next dc) across. (66 dc) DO NOT FINISH OFF. Row 1: Ch 20, working in sides of rows over dc posts, 3 sc over ch-3 of Row 1 Top Edging, (3 sc in next row) 11 times, 30 sc over ch-20; join. Finish off and weave in ends. Thanks for posting this pattern. 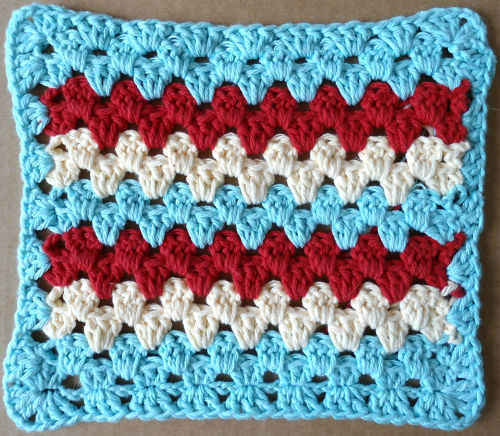 I love old fashioned crochet, but it can be hard to find the patterns. Thanks Again!